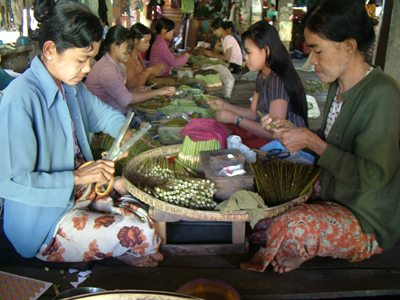 BAGO—Burma's traditional cheroot-makers are some of the lowest earners in the country. The imbalance between their daily income and expenditures results many of them struggling with debts at high interest rates, and living in abject poverty. “I have to work from 6 am to 10 pm for 2,000 kyat (US $2.50) per day while my 16-year-old daughter does the same for 1,000 kyat," said Aye Than, 42, a mother of three. As she speaks, she packs tobacco into cheroots—large hand-rolled cigarettes—by the dim candlelight in her house in the western outskirts of Bago [Pegu], about 90 km north-east of Rangoon. "However, I have to pay 30,000 kyat [$37] per month on a debt of 150,000 kyat. The main reason we borrowed the money is we cannot survive without food,” she said. She says that in 1988, she earned as much as 120 kyat for making 1,000 cheroots. But in those days, she says, she only had to spend 25 kyat for rice per day to fed her family. Today, a skilled cheroot maker earns 2,000 kyat per day to make 1,000 cheroots, but spends 1,000 kyat of that on rice. Aye Than says that after her husband passed away five years ago, she stopped sending her son to school after his matriculation examination, and had to withdraw her daughter from school while she was still in the eighth grade. "I needed them to work,” said Aye Than. She said her 21-year-old son is now working in her husband's native town in central Burma as a hard laborer earning 2,500 kyat per day, and sending 40,000 a month to his mother to help her out. 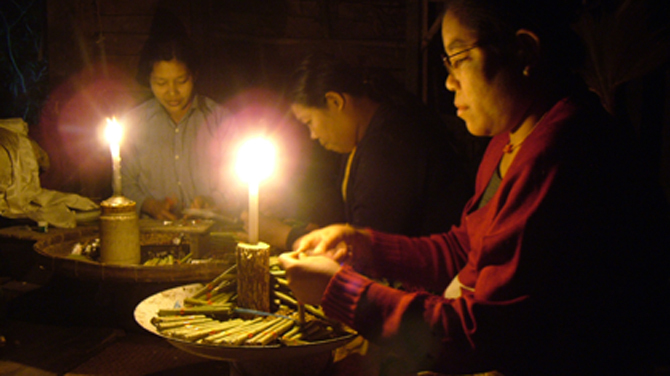 Cheroot-making is one of the most common occupations in Bago with about 20 factories. Almost every female in the town has rolled cheroots at some point in their lives—or, one should say, most of the poor and working-class females have. They work at factories or at home whereby the factory provides them with ground Virginia tobacco, filter tips and paper labels. Of course many of the women have children and must care for them as well as providing school fees. If the factory closes, for example due to floods, the cheroot-makers don't get paid. If the factory owners reject the workers' cheroots—if they are moist or off-color—again they don't get paid. Most of the women have found no alternative to borrowing money from loan sharks at crippling interest rates. "If we borrow 30,000 from a moneylender, she will immediately deduct 6,000 and give us 24,000 kyat,” said Aye Than. “Then we have to repay 1,000 kyat per day for 30 days. "If we can't repay it in full within 30 days, we have to pay compound interest," she adds. With no days off, no leisure time, no daylight and a poor diet, the average cheroot-maker's misery is exacerbated by bad health. “I would love to take a day off, but my children would go hungry the next day,” Aye Than said. Tettoe Aung asks: What has happened to all those money that was from the sales of gas and other natural resources? Most of it is still on the books. The Finance minister last week said Burma was 11 billion in debt (from Ne Win era loans plus new Chinese loans) but had 7 billion in reserves (about equal to all the gas revenues so far minus money used for imports by state companies over the past five years). But the 7 billion can not be spent until sanctions are lifted and currency is reformed (which cannot happen without IMF help). Every day under sanctions is another day women like this have to live in poverty. Aung San Suu Kyi has forced the country to live under 15 years of sanctions - for what? So she can get 48 seats in parliament? What has happened to all those money that was from the sales of gas and other natural resources? They are not the sale of natural gas from the gas fields from Than Shwe's privately owned gas fields (even though it might be named Shwe's gas fields). Or is it because we are given all these natural resources such as jade, timber and so on the China for free? We have to get the 'book-keeper' to get to the bottom of all the money that 'got away'. Fortunately for Baghdad, Ali Barbar had only 40 thieves with him but Than Shwe has many more, four million? You bet! The only difference that the new government has made is bringing new (second hand cars for the rest of the world)cars onto the streets. These do not have any benefits for the poor. There are only 280,000+ cars in the country and 52,000. Even if if all the cars were owned by a single family each it would affect only 0.56% of the total population. Nothing is being done for even 20% of the poorest of the country. 26% of the country live in poverty, that is one in every four, that is our country, one in every four does not have enough to eat, is not educated enough. I sure hope that ASSK has a plan because the guys in charge for the last 50 year did not have one at all! I visited a couple of these places last year and there were almost no other tourists around. Hopefully the economic situation will improve for these women who work in terrible conditions and perhaps some of the tourist dollars will start to filter down if more tourists see how the real people live. Can this pathetic cheroot maker ( people with similar scenario) be out of the debt wood by the ongoing reform and Gold Plated Democracy? What % of population in this category?